I am very much happy as my blog has completed 4 years and steps into the fifth year. A special thanks to all of you for your continuous support and encouragement to reach this milestone. :) Celebrating this with Badusha (Iyengar style). These type of sugar coated badushas are made in Iyengar marriages. Sieve flour, add cooking soda and mix well for 5 minutes. When it becomes like crumble, add butter and again knead for 5 minutes. Add very little water ( 1 ladle and if needed little more) to make a soft, smooth dough. Ensure there is no lumps. Add ghee and knead again for 5 more minutes without any lumps. Take a small ball ( little less than the size of a lemon), knead again and flatten it. Slightly press the centre. Repeat with all the dough. Keep covered. Meanwhile make the sugar syrup. Heat ghee/ oil and fry 2 badushas. Allow it to raise up. Then flip it to the other side. Flip 2 or 3 times. The badushas get cooked well if doing like this. It should be golden brown and cooked inside as well. Add little water to immerse the sugar, heat and when boiling, add milk and remove the scum which floats on top. By doing like this, you will get a pure white sugar-coated badusha. Make a syrup of thick and long one string consistency. Keep it ready. When it is still warm, drop the fried badushas, 2 badushas at a time and turn it well 2 or 3 more times until the sugar syrup is evenly coated on all sides. Then transfer it to a greased plate. When cool, the sugar syrup hardens and the badushas will be evenly coated with sugar. NOTE: Add very little water to the flour while kneading. The dough should not be too loose or crumble.It should be soft and pliable. If cooking soda is more the badushas will crumble while frying. So,its enough if u add a pinch. If it is hard inside, again add a pinch of cooking soda and knead again. If the sugar syrup hardens, add 1/2 a ladle of water again and keep on the stove to loosen. Its the butter badusha and sugar coated one. Congrats and do wish many more years of happy blogging. Congratulations. May we have more and more of authentic iyengar recipes. This particular sweet reminds me of a sweet from childhood.. famous in Mangalore called Saat. A very happy blog anniversary and many more to come. I agree with Radha. This sweet known as "Saat" in konkani is also famous in Mangalore. I love it too. 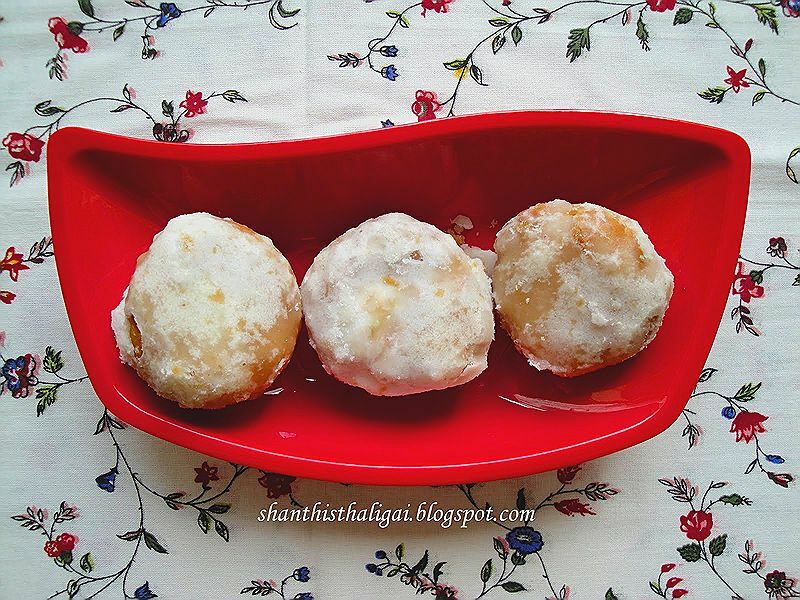 congrats on ur milestone and keep posting lovely dishes as u always do.The badusha looks verrrrrrrry sweet and tempting. Congratulations on the milestone Shanthi. Congratulation dear. Perfect sweet to celebrate anniversary. congrats on ur blog anniversary.., Badusha looks so beautiful.., and tempting dear..
A very delectable delicacy apt for the occasion. You tease your readers making them drool with enchanting pictures of the things you make. Congrats on the blog anniversary.Your blog has been a repository for traditional recipes! Love such sugar coated one. Its tempting. Congratulations Maami and wishing you many more years of blogging happiness! We are lucky to have more recipes from you all the time! Hi Shanthi, happy blog anniversary. Keep up the good job, hope to see more posting from you. Congrats Shantiji and wishing you many more happy years of blogging. I have sent you a mail,kindly acknowledge..
Badusha looks tasty and buttery! Thanks for visiting my blog. Hello Aunty! Congrats on your blog anniversary!!! The badhusha has come out very well..
Congrats for ur 4th anniversary.Badhush looks amazing. One of Nandu's favorite sweets from back home- love it and congrats on your 4th yr on the blog. Keep Blogging! Made this today following your recipe and the badusha has come out very well .